Dawn is on the threshold of a new world. After more than three and a half years of interplanetary travel covering in excess of 2.6 billion kilometers (1.6 billion miles), we are closing in on our first destination. Dawn is starting its approach to Vesta. The interplanetary cruise phase of the mission ends today and the 15-month Vesta phase begins. The first three months are the "approach phase," during which the spacecraft maneuvers to its first science orbit. Many of the activities during approach were discussed in detail in March and April last year, and now we are about to see those plans put into action. The beginning of the phase is marked by the first images of the alien world Dawn has been pursuing since it left Earth. 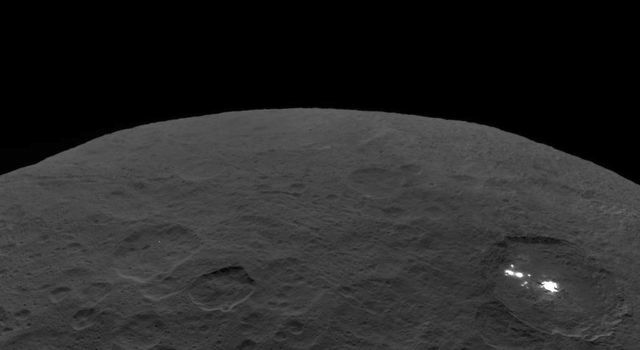 Vesta will appear as little more than a smudge, a small fuzzy blob in the science camera's first pictures. But navigators will analyze where it shows up against the background stars to help pin down the location of the spacecraft relative to its target. To imagine how this works, suppose that distant trees are visible through a window in your house. If someone gave you a photo that had been taken through that window, you could determine where the photographer (Dawn) had been standing by lining up the edge of the window (Vesta) with the pattern of the background trees (stars). Because navigators know the exact position of each star, they can calculate where Dawn and Vesta are relative to each other. This process will be repeated as the craft closes in on Vesta, which ultimately will provide a window to the dawn of the solar system. Even though the mysterious orb is still too far away to reveal new features, it will be exciting to receive these first images. For most of the two centuries that Vesta has been studied, it has been little more than a pinpoint of light. Interrupting thrusting once a week this month to glimpse its protoplanetary destination, Dawn will watch it grow from about five pixels across to 12. 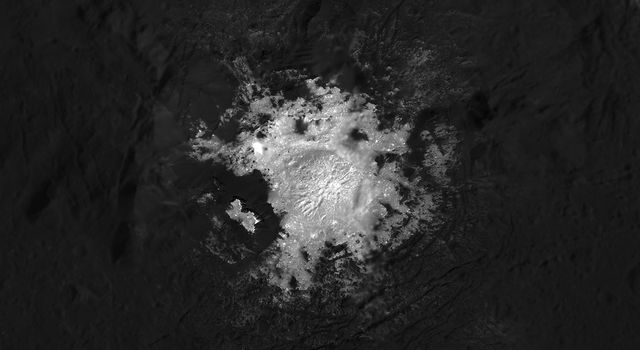 By June, the images should be comparable to the tantalizing views obtained by the Hubble Space Telescope. As the approach phase continues and the distance diminishes, the focus will grow still sharper and new details will appear in each subsequent set of pictures. During the approach phase, images will be released in periodic batches, with priority viewing for residents of Earth. The flow will be more frequent thereafter. The visible and infrared mapping spectrometer (VIR) will join the camera in spying Vesta on May 10 and again later in the approach phase. At the end of June, Dawn will watch Vesta for a full Vestian day of 5 hours, 20 minutes. When the camera searches for moons on July 9 and 10, it will also enjoy another full pirouette. By the third and final time the spacecraft observes Vesta throughout a complete rotation on its axis, during a set of observations from July 23 to 25, Dawn will be in orbit. 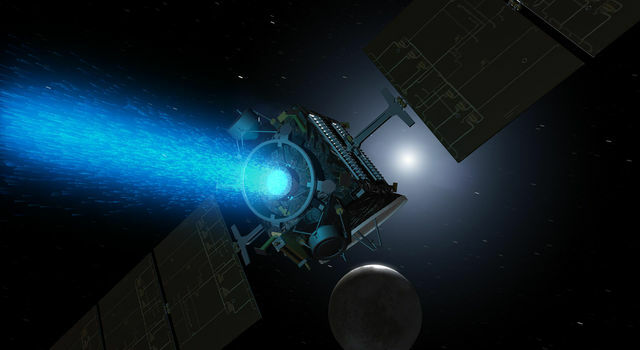 On July 16, when the ship is at an altitude of around 15,500 kilometers (9,600 miles) and propelling itself with its ion propulsion system in the same way it has been for more than 900 days of interplanetary travel, Vesta will gently take hold. For the first time since September 27, 2007, when Dawn rode atop the second and third stages of the Delta rocket for a short time in Earth orbit, it will be bound to a planetary body. The precise time and distance at which Vesta gains control of its visitor depend not only on subtleties of the thrusting until then but also on the strength of the giant asteroid's gravity. Among the many characteristics of Vesta yet to be known well is its mass. Astronomers have estimated it by detecting the tiny changes Vesta induces in the orbits of other asteroids and even of Mars, but those measurements yield only approximate values. One of Dawn's objectives is to determine Vesta's mass and to map its gravitational field. The approach phase concludes when Dawn is ready to commence its survey orbit in the second week of August. We will consider the timing of the beginning of this next phase in a subsequent log. At the beginning of the approach phase, the ship returns to using reaction wheels, gyroscope-like devices which, when electrically spun faster or slower, rotate (or stop the rotation of) the spacecraft. During Vesta operations, Dawn will turn much more frequently, as it points its sensors at the alien world it is exploring, aims its main antenna to Earth frequently to transmit its precious findings, and follows a complex flight profile to travel from one science orbit to another. The reaction wheels will be used until Dawn has departed from Vesta in July 2012, providing more accurate control of the attitude while conserving hydrazine. To enable the explorer to point its camera and VIR even more delicately, the ship's gyroscopes are powered on. Not to be confused with the reaction wheels, these devices help determine exactly what the attitude is so that the system can command the wheels to achieve the desired attitude. The gyroscopes are not needed for most of Dawn's activities during the interplanetary cruise phase of its mission, so they have been off for most of the mission so far. The gyroscopes serve another purpose at Vesta, which we discussed in more detail in January. The probe usually relies on star trackers for sensing its attitude. Each tracker takes pictures of the stars. Its internal computer processes the images, finding familiar patterns of stars to determine where it is pointed, just as you might use some of the constellations visible from your planet to orient yourself at night. When some component (such as the main antenna or an ion thruster) needs to be oriented in such a way that the star trackers happen to point at Vesta, the gyroscopes will take over so the spacecraft doesn't lose track of its attitude. There will be much to discover about the enigmatic 530-kilometer-diameter (330-mile) rocky world, but its ability to block starlight is not in doubt. While the science camera and VIR will be turned on and off as needed during the Vesta phase, the gamma-ray and neutron detector (GRaND) is being activated today and will remain on until the departure next year. Most of that time, the majority of the signals it detects will be from space radiation known as cosmic rays. But the closer it gets to Vesta, the more gamma rays and neutrons it will receive from the surface, gradually allowing scientists to formulate a census of the atomic constituents. GRaND's greatest ability to sense the faint radiation will be in the low altitude mapping orbit. The instruments were tested during a planned coast period in March, and each was in excellent condition. Dawn had another scheduled hiatus in thrusting from April 11 to 19, but this one was not intended for calibrations or tests. Rather, controllers had planned this for an upgrade to the software in the craft's main computer. The installation of software on our probe flying in deep space is a delicate task. To begin running with the new version, the computer has to be rebooted. That same computer constantly performs such essential functions as maintaining a steady attitude and acceptable temperatures. Controllers followed the same intricate procedures they used successfully to load new software in November 2007, April 2009, and June 2010. Preparing the spacecraft, radioing the new software to it, rebooting the computer, and commanding the craft back to its normal flight configuration all went exactly according to plan. Although more than a week was allocated, it only took three days. Dawn is now running what the team officially designates OBC flight software version 10.0, but what the more zany team members refer to as 10.0 or "ten oh." It may be surprising that even with the complex and rigorous work to overcome myriad challenges of operating the first explorer from Earth to take up residence in the main asteroid belt, normally dispassionate engineers can display such frivolity. Now with new software, the spacecraft is beginning the approach phase. Its journey has been long, but the reward is almost in view. Since leaving Earth in September 2007, Dawn has made about one and three quarters circuits around the sun as it spirals outward. Earth itself (along with your correspondent and some readers) has completed more than three and a half orbits in that time. But on May 14, Vesta will finish its first revolution around the sun since Dawn has been in flight; the mission will then have been under way for exactly one Vestian year. We have seen before that objects travel more slowly in more distant orbits, where the force of gravity holding them is weaker. Dawn has been climbing the solar system hill, traveling farther and farther from the sun at the bottom. It began its journey on Earth, partway up the hill. Now far above Mars, the probe is closing in on Vesta. As the adventurer and the mysterious world each race around the sun at nearly 21 kilometers per second (47,000 mph), Dawn is gradually closing in for its rendezvous. Two months ago, the spacecraft's course was bringing it toward Vesta at 0.7 kilometers per second (1,600 mph). Today, having completed more thrusting to bring its orbit into a closer and closer match with Vesta's, the craft is approaching at about 0.37 kilometers per second (830 mph). The speed will continue to diminish as Dawn gradually reshapes its flight path to be exactly the same as Vesta's. Soon, they will travel together around the sun. Meanwhile, the distance between them continues to shrink. Since the middle of March, Vesta has outshone everything in Dawn's sky save the sun. By the middle of April, a sharp-eyed passenger would notice that Vesta is more than a pinpoint of light like the myriad stars and distant planets; it would appear as a tiny disk, hinting of the exciting adventure ahead. (The passenger also might notice that his luggage was left back on Earth, more than 320 million kilometers or 200 million miles away.) Now, with Dawn's interplanetary cruise ending and the approach beginning, Vesta is coming into its sights, as the ship prepares to sail into port after an extraordinarily long journey across the lonely emptiness of the vast interplanetary seas. Dawn is 1.2 million kilometers (760,000 miles) from Vesta, or 3.2 times the average distance between Earth and the moon. It is also 1.90 AU (284 million kilometers or 177 million miles) from Earth, or 715 times as far as the moon and 1.89 times as far as the sun today. Radio signals, traveling at the universal limit of the speed of light, take 32 minutes to make the round trip.